Brussels, Belgium-based Wabco is a manufacturer and supplier of advanced driver assistance, braking, steering and stability control systems plus automated manual transmissions. Wabco operates in 40 countries. “We want to help with time to repair, and the certification process puts that standard out there. We do it in the rest of the world. We just haven’t had the opportunity to do it here until now,” said Jon Morrison, president of Wabco North America. Globally, Wabco works with 3,000 independent service centers. Morrison spoke with Transport Topics during Heavy Duty Aftermarket Week here Jan. 29-31. In the last 18 months, Wabco North America has grown from one aftermarket person (him) to 37 now, Aon said. The company has begun evaluating where to launch the program. 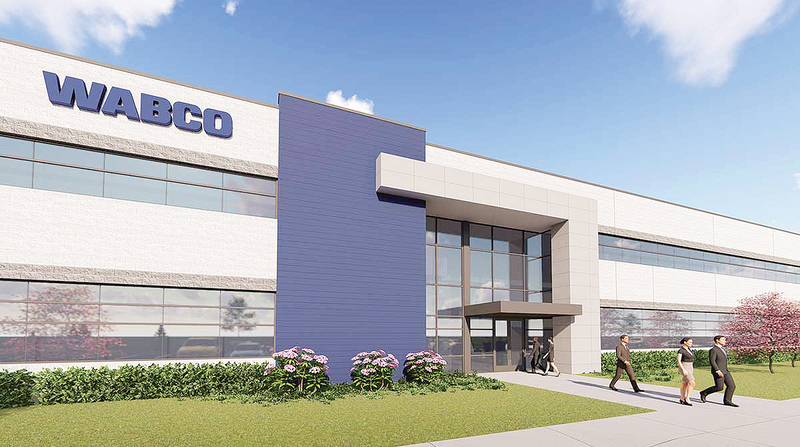 When it comes to service center locations, Morrison said, a starting point would be east of the Mississippi where Wabco has a higher concentration of trailer and truck content, and near key longhaul corridors. Wabco products are on brands from every truck and trailer manufacturer. Its fleet customers include Crete Carrier Corp., Schneider, Werner Enterprises Inc. and Walmart Inc.
Schneider ranks No. 7 on the Transport Topics Top 100 list of for-hire carriers in North America. Werner ranks No. 15 and Crete ranks No. 34. Walmart ranks No. 3 on TT’s Top 100 list of private carriers in North America. Aon said the landscape of trucking is getting more complex with more electronics and the increasing need for better trained technicians. And there’s always a need for independents able to serve multiple makes of trucks. A truck is becoming much more connected through the software and technology platforms, Morrison said. So when a problem arises and a light comes on in the cab, the cause is not always obvious and can be pretty complex to figure out amid layers of data. Meanwhile, Meritor remains Wabco’s exclusive North American distributor for certain products for the next nine years. At HDAW, Wabco announced several new aftermarket safety products as well as certified Sheppard remanufactured steering gears for the North American aftermarket. These included: retrofit kits for the OnSide and OnGuardACTIVE collision mitigation/avoidance technologies to existing vehicles, Wabco remanufactured trailer antilock brake systems that are available in one- and two-modulator configurations, a dump box position sensor retrofit, part of the SafeStart family of products from Wabco that warns the operator when the vehicle exceeds a preset programmed speed with the dump body extended. Its Mico brake lock retrofits are available, too, for construction, mining, agriculture, material handling, multistop delivery and recreational vehicles — and fit most medium- and light-duty vehicles.